A dispute between the Lithuanian community of Muslims and the Vilnius government regarding the construction of a mosque in Vilnius has been going on for years already. The community is in the running for land for the construction of the mosque. The authorities of the city are proposing to build the mosque at the Žirnių Street, near the old Karaite cemetery. However, the proposition of the authorities does not suit the Muslims. The government of Vilnius offered a few localizations i.a. on Antakalnis, Pilaitė, and Grigiškės, in the district of Naujininkai, near the cemetery at the Žirnių Street, near the old Karaite cemetery. Another idea – Sietyno Street in the district of Karoliniškės. As the press secretary of the mayor Aleksandras Zubriakovas informed, Remigijus Šimašius has already met twice with the representatives of the Muslim and Tatar Community but the problem is that they are not able to agree among themselves on what they want. “The mayor approves the actions of the community to have their own temple, all the more reason, there used to be a mosque in Vilnius but it was demolished during the Soviet period. (…) Nevertheless, the authorities of the city say that the Tatars and the Muslim community cannot reach an understanding regarding the localization of the mosque”. The mufti of the Lithuanian Muslims community Romas Jakubauskas claims that the local government offered them the land in Karoliniškės, which the community accepted, and now the government is trying to persuade them to take the land at the Žirnių Street, which does not suit them. As Jakubauskas says, the old maps show that the place used to be a Catholic cemetery. “We do not want to build the mosque on the old Catholic cemetery. We respect the gravesite of the followers of other religions and we don’t want to build our temple on someone’s bones” – he said. According to the common population census of 2011, there are about 3 thousand Sunni Muslims in Lithuania. Although, Romas Jakubuskas assures that there are about 5 thousand of them, including around 1,5 thousand in Vilnius. 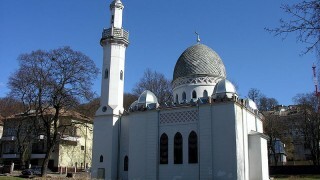 Currently, there are four mosques in Lithuania: in Kaunas, in the Alytus District (in the village of Raižiai), and two in the Vilnius region (in the village of Keturiasdešimt Totorių and Nemėžis). The people gather for players in Vilnius in the Islamic Center of Culture and Education. “There is a beautiful mosque in Kaunas – the gift from the country for the Lithuanian Muslims for their contributions to the statehood of Lithuania. Why in Vilnius, where – as the history decided – the biggest community of Muslims lives, we cannot have such building?” – said Romas Jakubauskas. In Vilnius, on Lukiškės, in the 17th century there was a wooden Tatar temple built. At the beginning of the 20th century, a construction of the brick mosque was planned, however, these intentions were changed because of the outbreak of the World War I. After the World War II, the authorities of the Lithuanian Soviet Socialist Republic have decided to raze to the ground the historic temple. The Tatars emerged in the Grand Duchy of Lithuania in the middle of the 14th century. They had a shelter from the religious arguments and political battles in the Empire of the Golden Horde. Some of them settled after being taken captive during the wars. A few hundreds of Tatar gens, who came to the Grand Duchy of Lithuania at the time of Vytautas, blended in the local community. Currently there are more than 7 thousands of the Muslim Tatars in Lithuania.